Event Horizon Research Website is in the process of being updated and relaunched. The Bank of England has more than made up for it’s surprise inaction last month as today’s policy announcement met our expectations for both a rate cut and the resumption of Quantitative Easing. 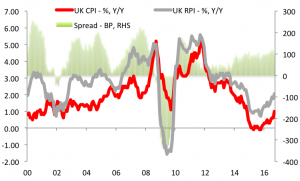 While the GBP60bn expansion of QE was less than the GBP100bn we were expecting, the BOE over-delivered in other areas: it signposted a likely move to a near-ZIRP policy this year; it unveiled a new scheme to help the transmission of the policy rate cut to the real economy in a manner which will also ease the burden of lower interest rates on bank earnings; it announced a GBP10bn purchase scheme for corporate bonds. Following today’s announcements many of our existing market forecasts might appear conservative. While we still expect GBP/USD to head below 1.20, our 25bp target for 10y Gilt yields appears too high. Indeed, with Gilts expected to be increasing viewed as collateral rather than yield instruments over the coming quarters, the downside for Gilt yields is substantial. Our target for the GBP IRS 10fwd 10yr of 1.0% also looks conservative with 0.75% appearing more likely. However, from an economic growth perspective today’s announcements can only have a muted impact in offsetting what we expect to be a 3% Brexit effect on UK GDP growth. The baton now must pass to the government where we believe a 2% of GDP fiscal stimulus is urgently required.